In Victoria, seedlings are planted approximately 45cm apart in rows 1.2m apart. This gives a plant population of approximately 18,000 plants per hectare. Soil preparation involves working the ground until it is a fine tilth. 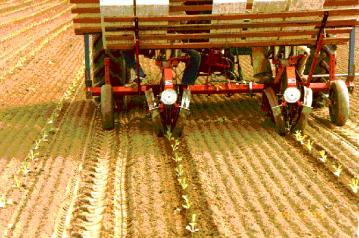 Planting is partially mechanised, with two people working on a tractor-drawn planter as in Figure 1. Planting occurs in Victoria from late October through to the end of November. Once the crop is planted the land is cultivated regularly to control weeds and allow heat and water to penetrate, until such a time that the plants root systems become too large to allow cultivation. During the final cultivation, the plants are "hilled up" which creates a piled ridge of soil around the plants. Nitrogen is the most important nutrient which is able to affect leaf maturity, quality and chemical characteristics. Levels of nitrogen fertiliser are based on previous experience for a given paddock. Nitrogen, phosphorus and potassium with small amounts of magnesium and sulphur comprise the basic fertiliser dressing. All fertiliser is applied before planting. 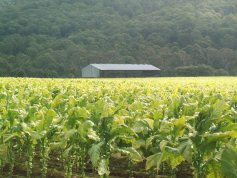 The amount and type of fertiliser is a critical factor in the production of good quality leaf and requires growers to have a working knowledge of each paddock to achieve the desired result. Soil tests are done on a regular basis to ensure that the correct amounts of fertilisers are added. 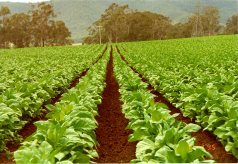 Tobacco like other intensive row crops (such as vegetables, grapes and cotton) is susceptible to a wide range of pest and diseases. Insects, fungi, bacteria, nematodes and viruses can all potentially cause problems. Growers use a range of control measures including cultivation, chemicals and cultural practices (such as rotation with resistant cover crops, use of resistant varieties, and planting healthy transplants) to minimise potential problems. Weeds are controlled by a combination of mechanical (such as cultivation) and chemical measures. Good weed control prevents some insects, nematodes and fungi from living on weeds in the paddock, and is also important to prevent competition with tobacco plants for water and nutrients.